Over 40,000 lessons given, 23 years experience. This instructor is innovative, versatile and excellent with all levels of golfers. His bright mind and gentle heart make this PGA Class A member a joy to learn and mentor with. Trained by some of the industry’s best, his is published and recognized by his peers. To view the personal bio for Dave Johnson click here. Golf is a game, sport and skill that they will use all through their lives. Golf is outdoors in the fresh air, the children are in a positive healthy environment. Golf is a game that abides by “rules, respect and etiquette”. Golf camp teaches youngsters to interact in a social environment. Golf teaches us to problem solve and develop self reliance. Has been a PGA Class A member since 1992. He began giving lessons in 1988. He was rated Sonoma County’s 3rd “Best Instructor” in a Press Democrat poll in April 1992. His teaching goal is for all of his students to recognize how important the “short game” is to their golf game. As an LPGA Class A member, she has been trained to help each individual find the golf swing that best fits his/her strengths. Her encouraging personality and sense of humor make it fun to learn to play golf. Her students often comment that they never thought golf could be so fun and rewarding. This PGA Associate started playing golf when he was 14. His teaching is based on the idea of keeping things as simple as possible. Basic fundamentals of grip, stance and alignment can go a long way toward developing a swing that is simple, effective and repeatable. Making the game of golf fun whether practicing or playing is key. Call: 415-613-5929 Mary Jo, has been coaching golfers at all levels for over 19 years. In addition to being a Class A Member in the LPGA, she is a First Tee Coach, is US Kids Golf certified and has coached at both the boys and girls high school level. Whether you are new to golf, have a junior golfer, or looking to improve your golf game we can customize your needs on the driving range or a playing lesson on the golf course. Lesson Fees: Adults 60 minutes $100 30 minutes $50 Juniors (17 and under) 60 minutes $80 30 minutes $40 Group lessons/ Clinics $25 per person max 6 students Winter Special – buy a series of 3-1 hours lessons for $275. Mary Jo Hodgen is a nationally recognized Callaway club fitter. The 2019 line of product is available for fittings and demos, contact her to schedule your fitting or to demo clubs. Fitting Fees: Irons $35 Driver, fairway woods and hybrids $35 Putter/wedge $35 Complete fitting $ 75 Demo sets of the 2019 line of Callaway clubs are available to try on the golf course. Cost is $25 and is applied towards your purchase of clubs. Contact Mary Jo to schedule your lesson, fitting or to demo session. Our ultimate objective is to administer effective and innovative golf programs to all levels of golfers at a friendly, family oriented facility. Our staff of professionally trained golf instructors is committed to bringing golfers creative and rewarding instruction that exceeds expectations. Using humor, encouragement and creativity, Rooster Run’s golf instructors are here to provide you with the best possible golfing experience within a fun and rewarding learning environment. An 8:1 student to teacher ratio is maintained and campers are arranged by age first and then ability. 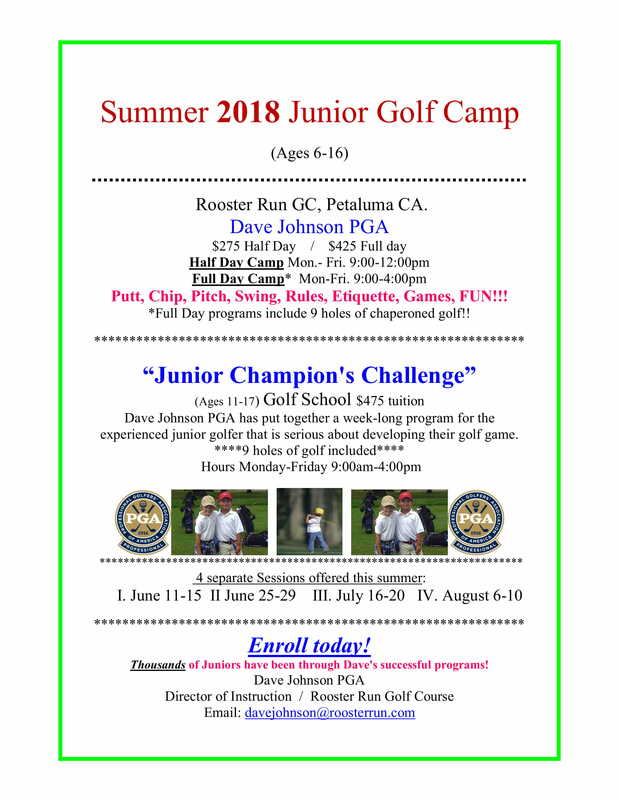 Dave Johnson PGA has put together a week long program for the experienced junior golfer that is serious about developing their golf game! Program participants will learn to improve playing skills, to compete effectively, practice successfully and how to train physically. If your junior golfer is serious about golfing well this is the program for them. Five sessions will be offered with a low 6:1 student to teacher ratio enforced, registration will be on a first come first serve basis. 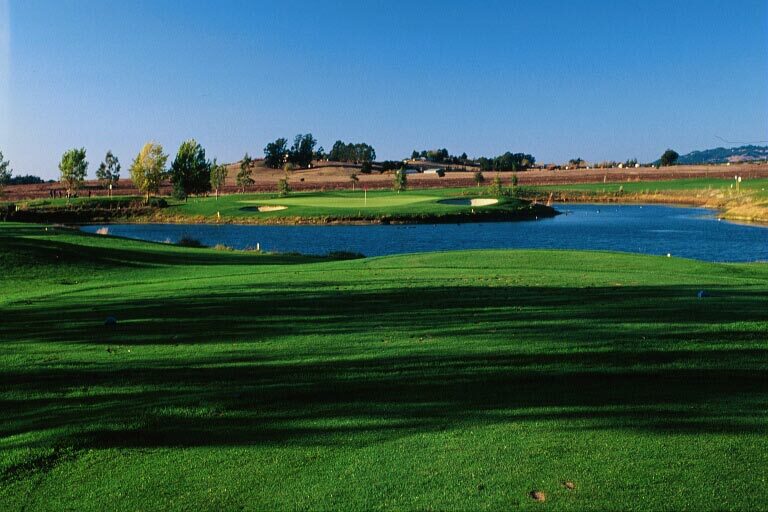 Each daily session will also include 9 holes of supervised golf!